Justin's crazy work schedule as a firefighter means that the two of us are always looking for ways to have mini dates whenever we can. One tradition we have started is that when he comes of shift on a weekend morning we sit together downstairs, drink coffee and share breakfast while catching up on each others lives. It has become our little way to connect in the mornings before the craziness of weekend days take over. 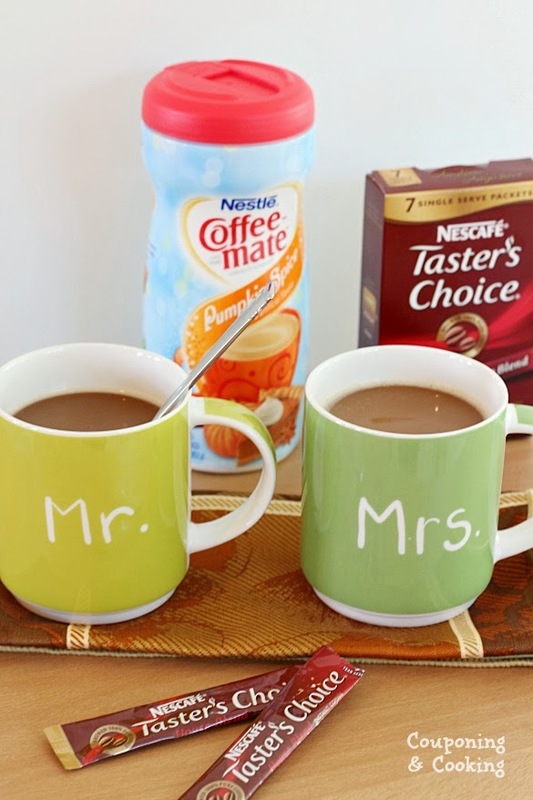 Usually when he gets home, Justin is exhausted so I like to have something ready for him which is why the ease of Nescafe Taster's Choice Coffee is perfect. 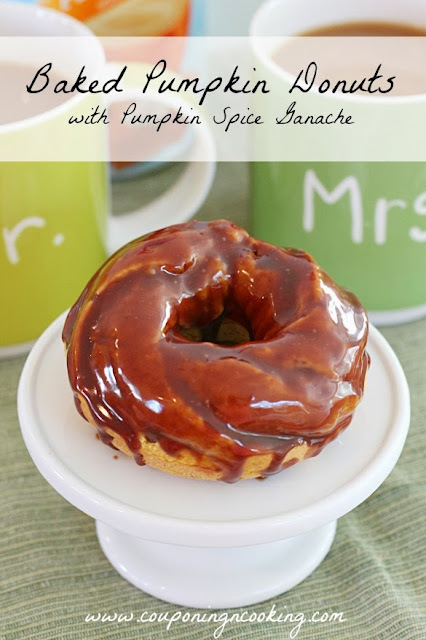 This past weekend I decided to set my alarm an hour early to make him a special treat to celebrate the beginning of fall and these Baked Pumpkin Donuts with a Pumpkin Spice Ganache were definitely a surprise for him. 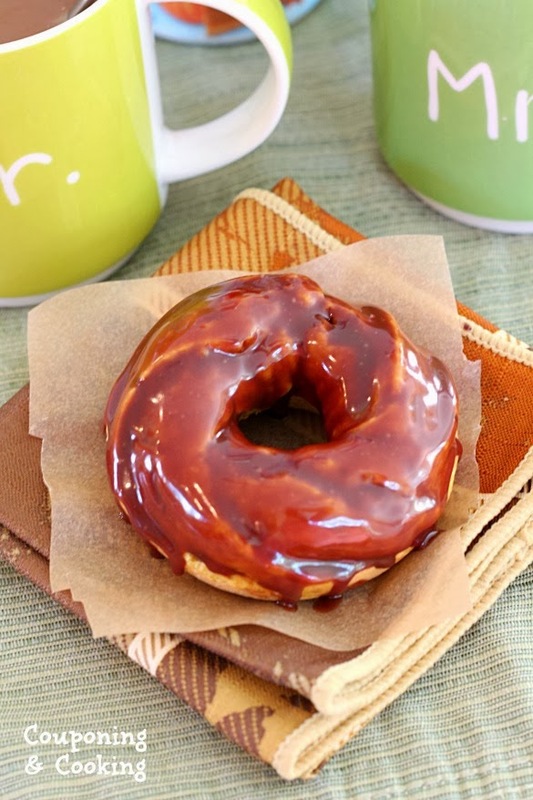 It was so nice to sit together and enjoy a fall flavored cup of coffee and and donuts. We made plans for our October weekends and outlined a menu for our game watch later that night. After a hectic week for both of us, it was exactly what we needed. Not only was our coffee flavored with Pumpkin Spice Coffee-mate but the chocolate ganache on the donuts was too. 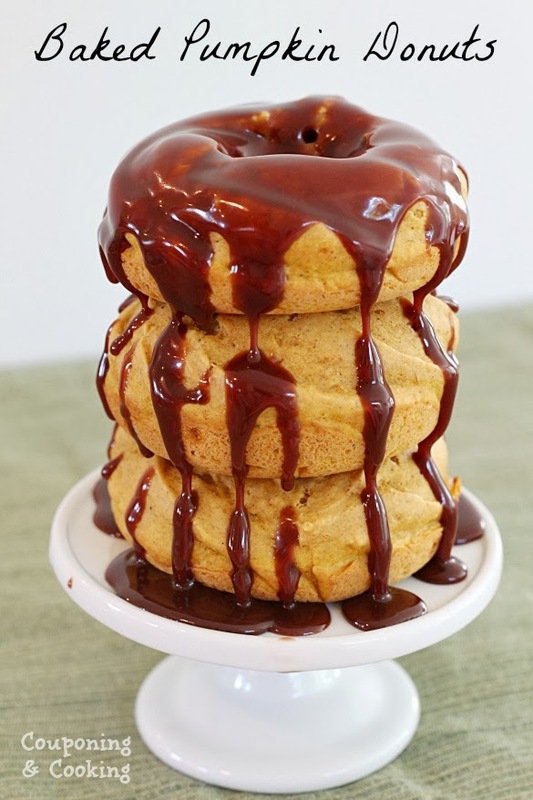 The Coffee-mate mixed into the heavy cream of the ganache gives it just enough spice without being too intense. 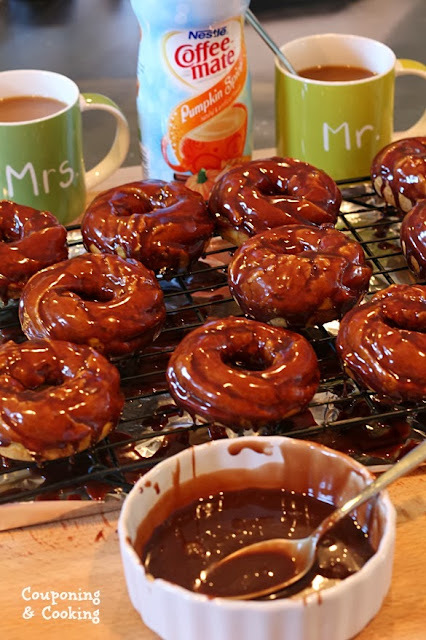 The donuts are baked so they are light and fluffy and just sweet enough to be topped with gooey, pumpkiny chocolate.We may or may not have used pieces of donut to wipe the last few drops of ganache out of the mixing bowl as we were cleaning up. Sorry I'm not sorry. While the donuts are amazing, the ganache is what really made them. I am having visions of drizzling it over everything known to man and I will clearly be stocking up on the powered Pumpkin Spice Coffee-mate for future use as well. 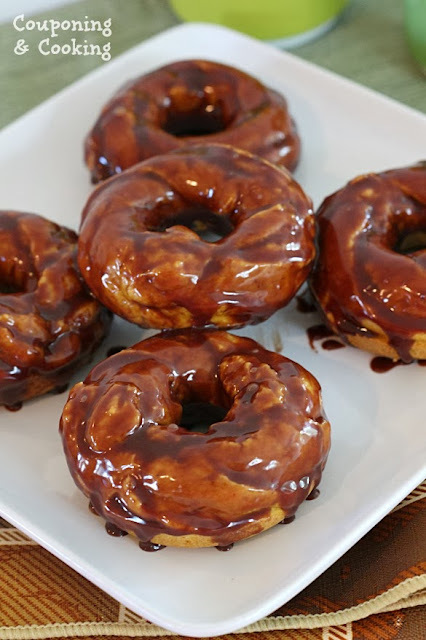 These donuts are best eaten fresh so you can always make just a few for you and a loved one or whip up a whole batch for your next book club or family breakfast. Now all I need are the temperatures in South Florida to catch up to the baking in my kitchen so Justin and I can enjoy our next coffee date outside on the back porch. 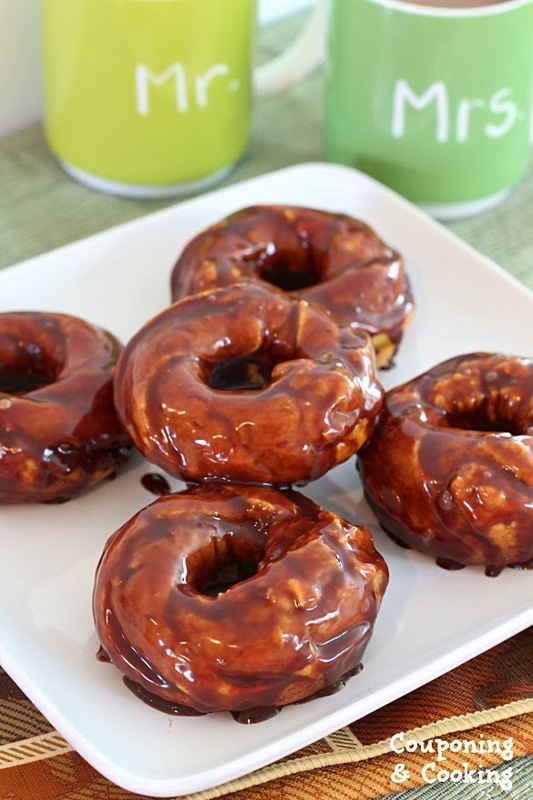 Oh well, these donuts would be worth drinking coffee in the 85 degree humidity for. But I think I will stick to the AC. At least until November. 1.) Combine all the ingredients in a large mixing bowl and beat together until combined. 2.) Using an icing bag or icing gun with a large star tip, fill a greased donut pan with the batter. 3.) Bake at 375 degrees for 10 minutes or until golden brown. Cool on a wire baking rack. 1.) Whisk the powdered Coffee-mate into the heavy cream. 2.) In a double boiler, melt the chocolate chips into the cream stirring occasionally. 3.) Once the chocolate is completely melted, whisk smooth and remove from the heat. 4.) Let cool for five minutes and then frost completely cooled donuts.